As the dream begins, I’m sitting in my home late at night, bored. I decide I want to go shopping, but there’s a problem: my car doesn’t work. So I go outside and walk through my neighborhood until I find a vehicle to steal — although I call it “borrowing”, because I fully intend to return it. I choose a big blue van. The van is unlocked, and when I hop in, I find a set of keys in the ignition….let the party begin. I crank it up and head for Little Rock. About 40 minutes later, I arrive at Target. I park and get out, ready for some serious shopping. But just as I approach the store, cops swarm the parking lot. DAMN, they’re onto me. I run across the lot and head for the nearest house…it’s a small red brick home, probably 2-3 bedrooms. After breaking one of the windows with a rock, I climb inside and fall into a dark room. I crawl and fumble around in blackness for several seconds, then I reach out and feel a human leg. As I stand up, I hear the *flick* of a light switch, and the room is illuminated. I’m standing face to face with actress Anne Hathaway. Anne: “Do you like my hair?” She rubs her head. Her hair is in corn rows. And with that, I drop her Oscar on the floor, climb back out the window, and flag down the cops to turn myself in. The moral of this dream: crime just doesn’t pay, kiddos. 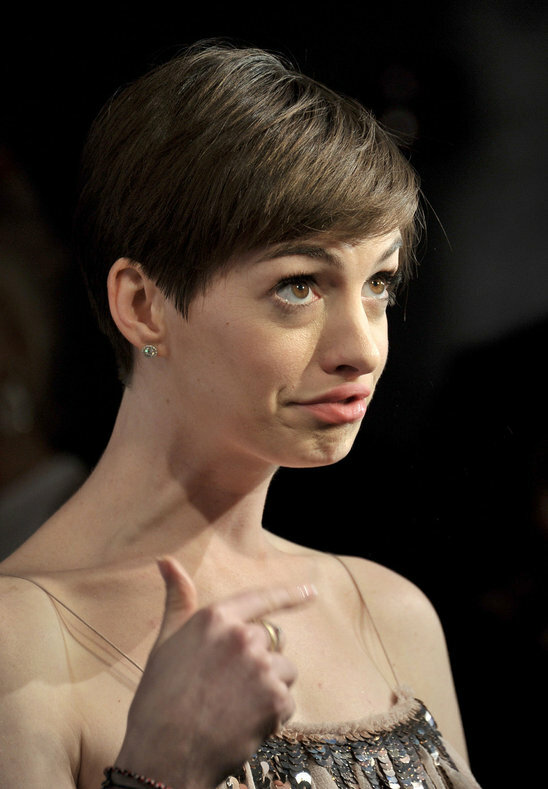 DISCLAIMER: NO ANNE HATHAWAYS OR OSCARS WERE HARMED DURING THE MAKING OF THIS BLOG.